It really depends upon your comparison. In November 2009, the quantity of homes (detached) sold in South Walton increased 58% over sales in November 2008. However, they are down 26% compared to last month. If you closely examine the graph below, you will see that it is common for sales to decrease in the last few months of the year. This year, we saw a change in that, where sales actually increased month to month, from August through the end of October. It is obvious that home sales activity has increased, compared to the last three years. It is easiest to see that by focusing on the white colored 6 month moving average line in the graph below. Has there been a similar increase in dollar volume of sales? 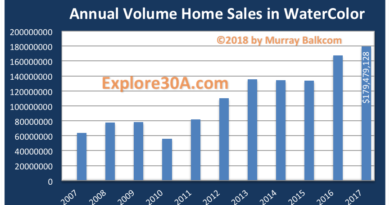 For the first time since the local real estate market’s peak in 2007, we have seen more of a steady, to slightly-upward trend in median sold price of detached homes during 2009, as indicated in the graph below. Since inventory remains elevated, I have a feeling that we will not see the median sold price increase much in the short term, but only time will tell. I wouldn’t be surprised if the number remains fairly level until more of these REO (bank owned) and short sale properties are sold. I encourage your comments and questions. Please click on “comments” below this post, to add your comments or questions. Check back soon for more updates, including residential land and condo sales in South Walton. 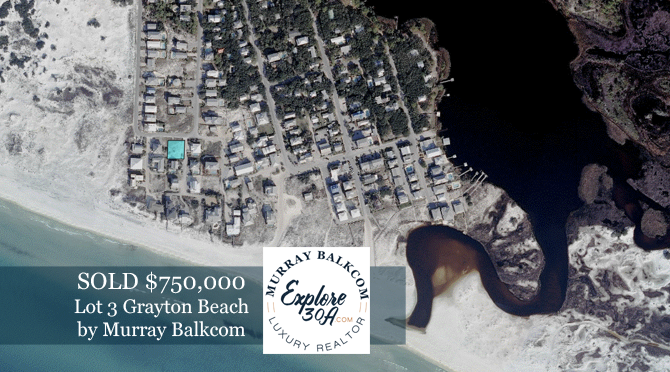 Murray Balkcom is a Realtor with Coldwell Banker United, Realtors in Seagrove Beach, FL. To subscribe to Murray’s real estate updates, go to www.dreamBIGproperties.com and in the upper right corner, submit your email address. Then, check your email and click on the confirmation link.